I just finished uploading the third set of photos that I had scanned in by ScanCafe. We’re coming up on the first anniversary of Dad’s passing. It’s hard to believe it’s been almost a year now. 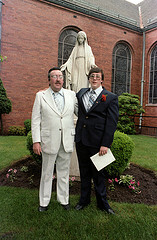 There weren’t too many pictures of Dad in this bunch (he was usually the one taking these photos), but here’s a nice one of Dad and Mike, at Mike’s confirmation, outside the church.